Turtles are one of the most majestic and peaceful creatures of our oceans. Yet they fall victim to many things, largely humans. 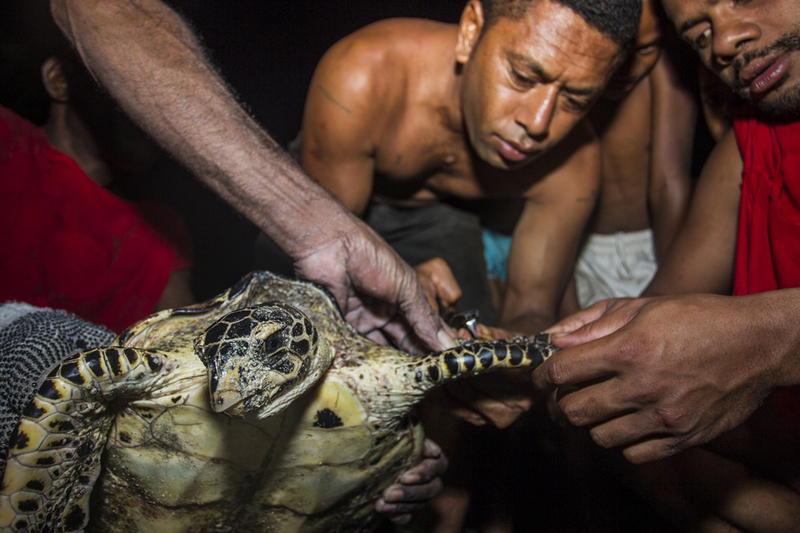 This old hawksbill was found dying in a mangrove swamp. A huge gash across its shell, no doubt from a boat collision. The gash was irreparable and the body left for nature to take its course. Fiji. Two years ago these Fijian islanders were eating turtles. Today, turtles are still caught but not for food. The islanders realised the turtles were dwindling & now catch and tag them before releasing them. Inia is the Taraga ni Koro, the village headman for Uluibau, Moturiki, Fiji. He is also the local fish warden, he can enforce fines if someone is fishing illegally. Villagers are trained as fish wardens around the remote Fijian islands, where police may not be able to patrol regularly. Much like a bird ring the tags are individually numbered, one is clamped quickly into each front fin of the turtles. They don't rust and hopefully if a fishermen catches the turtle accidentally, or a diver encounters the turtle on a reef it can be identified to work out its movements. But why aren't the villagers eating the turtles anymore. Inia says, ‘Turtles aren’t like they used to be, we see less. Before they used to come and lay their eggs now there are none. If you’re lucky you may see some when you’re out fishing but not like old times. For the future’ Inia tells me. ‘If we keep catching turtles, there will be none, maybe if we stop there will be more’.